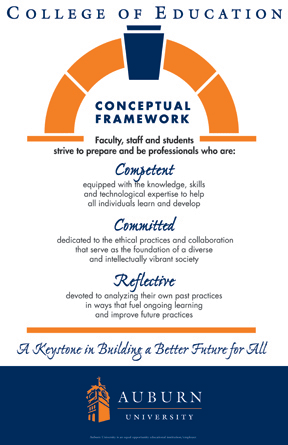 Our Conceptual Framework is grounded in a view of continuous improvement that is steeped in collaboration and reflection, situated within school and community partnerships, rooted in a commitment to diversity as a core value, and supported by explorations of emerging technologies. The knowledge base draws on theories, research, the wisdom of practice, educational policies, and professional standards. It integrates current understandings related to learning and human development, curriculum and instruction, assessment, diversity including exceptionality, subject matter expertise, leadership, and advocacy. We embrace this broad and comprehensive knowledge base and actively contribute to its advancement.